You've probably used Google to search for recipes, or to find out what the heck that mystery food on the ingredients list is. 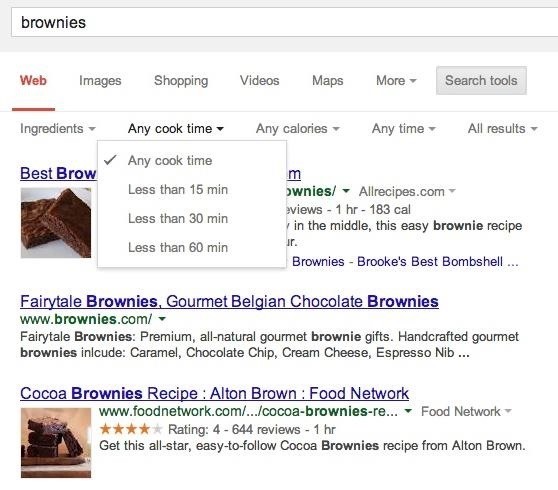 But with all its built-in features, there are plenty of other ways the search engine can help you out in the kitchen. Whether you're on a computer, tablet, smartphone, or even Google Glass, here are a few ways Google can help you with your cooking. 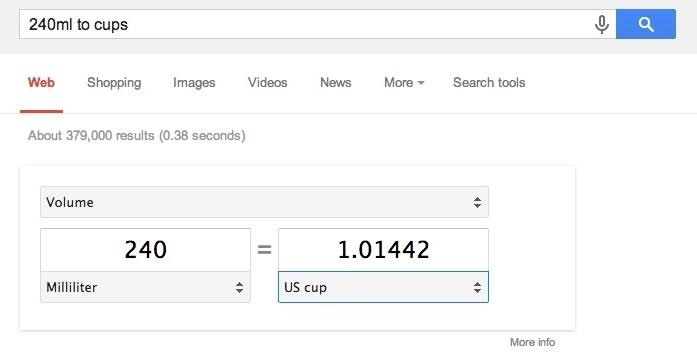 If a recipe calls for 240ml of chicken stock but you're unfamiliar with the metric system, you can use one of Google's built-in tools to convert it. 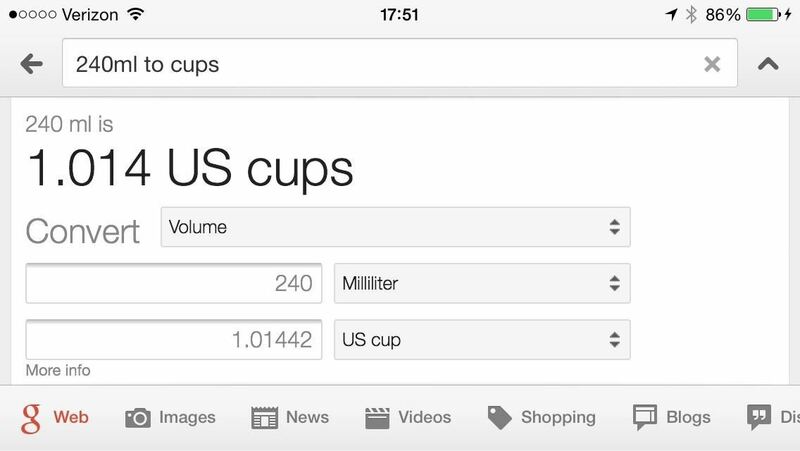 Just type 240ml to cups (or another unit) and it will display the results at the top of the search page. It works for units of volume, temperature, and weight, and the drop-down menus make it easy to look up several different conversions without typing in a new query. 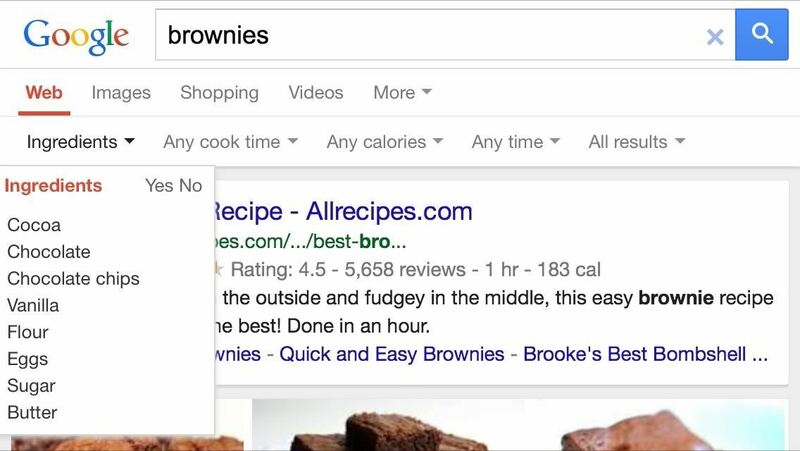 There are a few sites that let you search for recipes based on the ingredients you have one hand, but Google's recipe search lets you do that as well. You can filter by ingredients you want to use or exclude, the time it takes to prepare, and the number of calories in the final dish. Just enter your query, then click on Search Tools (right under the search bar). This will bring up the filters for ingredients, cook time, and calories. If the additional options don't show up when you type the name of the dish, add "recipe" to the end of your query to see them. Even if you already have a kitchen timer, there are occasions when it's nice (or necessary) to have more than one. 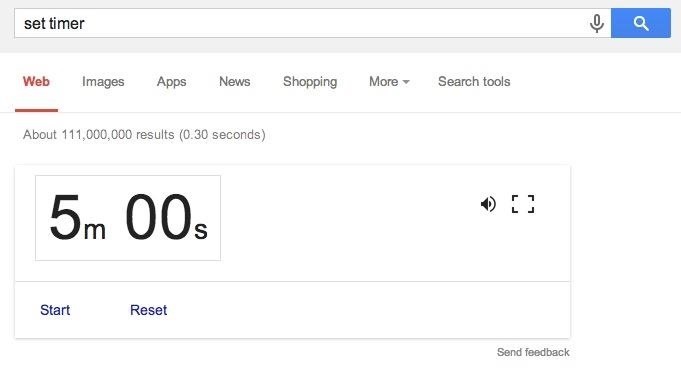 Since Google has a built-in timer function, all you have to do is type set timer into the search bar. The default is 5 minutes, but you can change it to whatever time you need. From what we can tell, this feature only works on computers. We tried this on Apple and Android mobile devices with no luck, though they already have built-in timers, so it's probably best to use those anyway. Also, typing "set timer for x minutes" used to bring up a timer that was already set for the time you chose. Last year, Google removed the feature, brought it back a few months later, and now it works for some, but not for others. 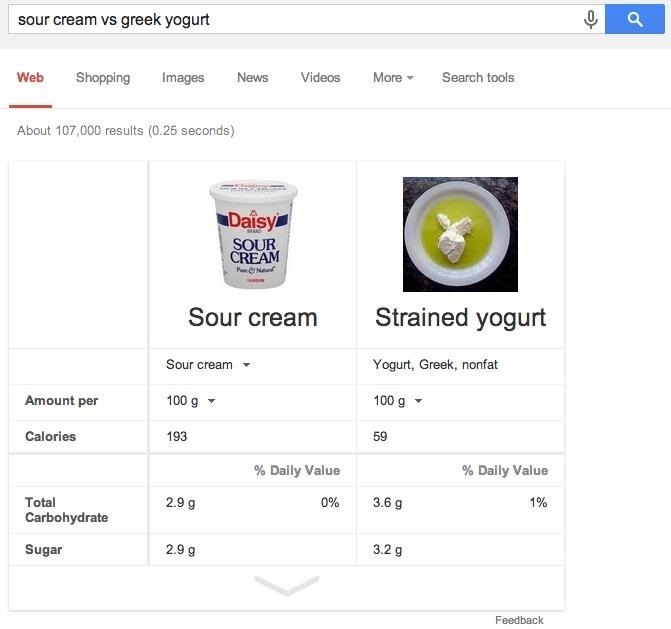 For a lot of foods, finding nutrition facts is as simple as typing the name into your search bar. 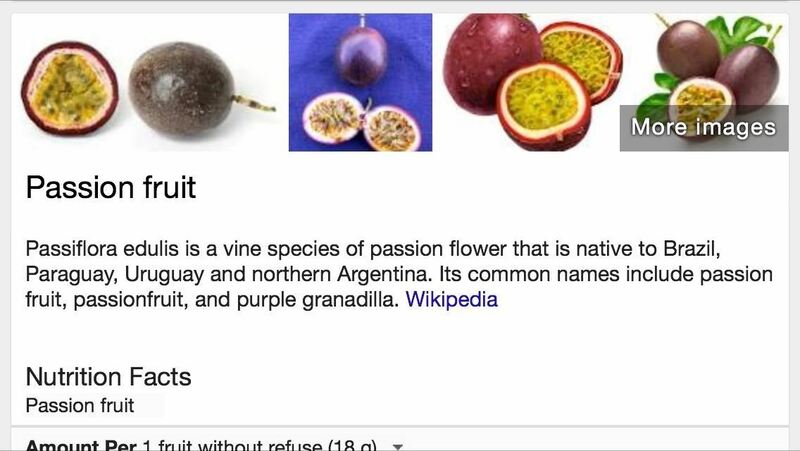 Google will display results for that food with a box on the right-hand side that displays the first paragraph of the Wikipedia entry and all the basic nutrition facts underneath. If the name of the food doesn't do it, just add "nutrition" to your query. 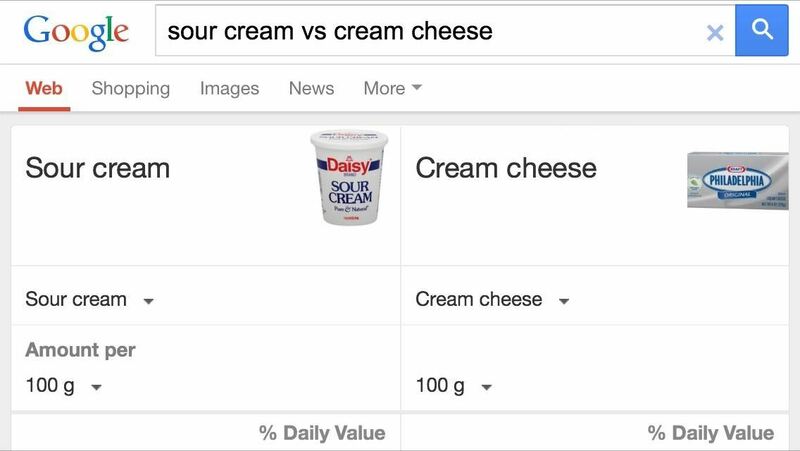 If you're debating between two different foods, you can easily compare them by typing food 1 vs food 2 into Google. It will bring up a chart that shows both foods side by side with the calorie count per serving and other nutrition facts. Like most every tip here, this also works great on mobile devices. With the Google Now app on your smartphone, you can use it to do most of the above functions hands-free by searching with your voice. 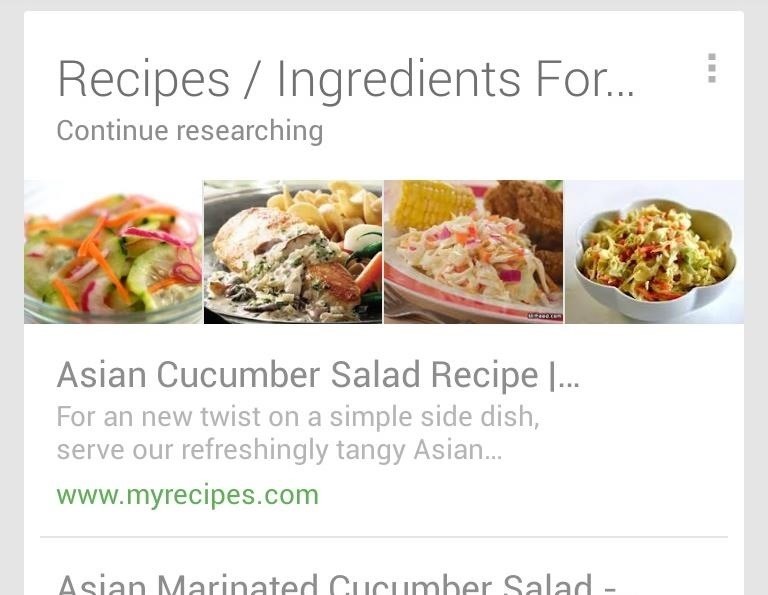 If you search for recipes a few times, you may start to see recipe cards pop up that give you ideas based on what you've already searched for. However, this feature is only for Android devices right now, and you have to enable "Web History" for it to work. The app can also help out when you're actually cooking. Use it to set reminders for when it's time to add ingredients, or as a timer for the dishes you have cooking. Plus, if you have a question while you're cooking, you can have the answer read aloud so you don't have to stop what you're doing or touch your phone with dirty hands. Google's search by voice function works on your computer, too (in Chrome, at least). Just go to the homepage and say "OK Google" or click on the microphone icon in the search bar to activate speech recognition. If you're one of the few people using Google Glass, there are some really cool cooking apps out there. KitchMe lets you search for recipes and send them to Glass, automatically creates grocery lists based off of ingredients, and speaks the instructions to you as you cook. NavCook has all these features plus a photo to accompany each step, but doesn't have as many available recipes. Allthecooks is a cooking app that lets you share what you're up to in the kitchen with friends and family. It's similar to KitchMe and NavCook, but with a social aspect. It's got a wide variety of recipes with an active community, and apps for both iPhone and Android so you can sync it with your phone. How do you use Google in the kitchen? If you know of any tricks, features or apps that we missed, let us know in the comments.